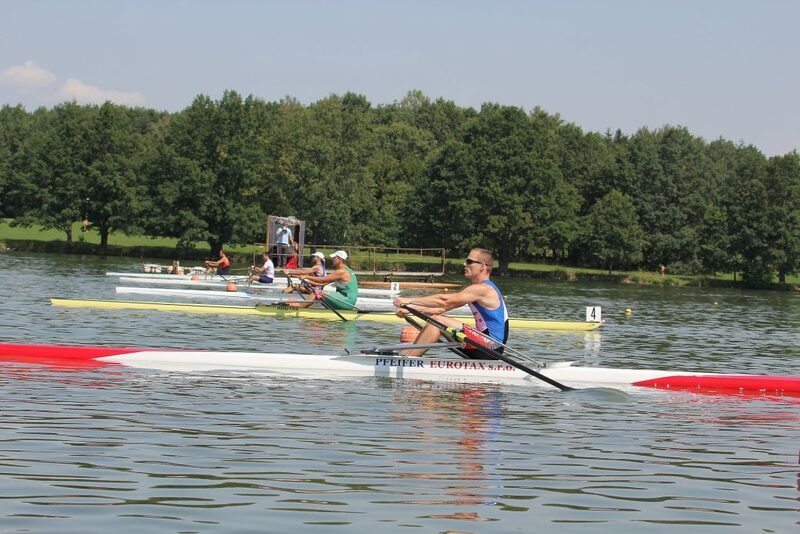 A nice technique row in the double with Romana. The weather was nice with very flat water when we launched. 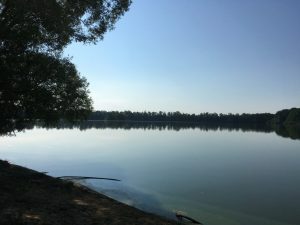 The only issue was low visibility because somebody was burning leaves or grass on the other side of the lake, and the smoke cloud covered a large part of the lake. We rowed up to Rokle, and then back to Sirka through the middle of the lake and through the smoke cloud. Then we turned at Sirka and rowed back. When we were about 1km from Sirka, we saw the fire brigade rushing towards the lake. I thought somebody had called them because of the guy creating the smoke cloud. A little later, the rescue service and the police sped across the lake in their speed boats. I started wondering. They sped to an area in front of Lodni Sporty rowing club, but then they moved to the beach around the 1km mark, roughly where we were rowing when we first saw the fire brigade. A few minutes later, a helicopter arrived at the scene. We continued our technical/steady state row to Rokle and then turned. The beach at the 1km mark was now full of police, ambulance, fire brigade, and the two speed boats. At that time we thought it was a drill. Not true. We were witnessing desperate attempts to save someone’s live. According to the news, a person of about 65 years of age was playing with a remote controlled model airplane. The plane fell into the water, and he decided to swim for it. Which cost him his life. Difficult to guess what happened, but a few meters below the surface, the water is not exactly warm. 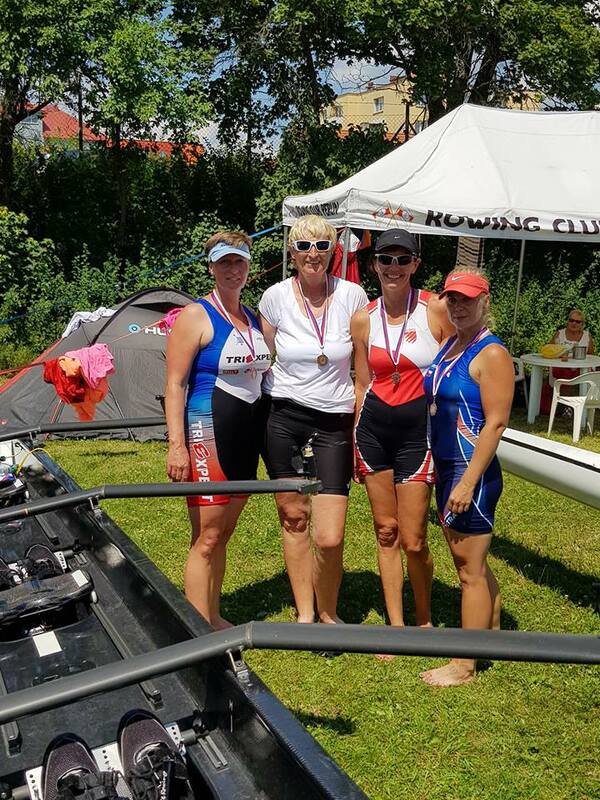 Of course we didn’t know anything about that when we were rowing, and we were quite happy with the pace achieved at a relatively light pressure. Did I mention the water was quiet and mirror flat? I nice weights workout in the gym. I found a free hour in the afternoon and did a thorough weights session. Increased the weights on some of the exercises. A 2km swim followed by a hot tub. We went to Kurim, where they have a 25m pool. I prefer a 50m pool, but this was a nice workout. The water was nice. It was good to be swimming again, and I got a very good workout. On Tuesday, I did a weights session. The first weights session after vacation, and as expected it created shoulder and breast muscle soreness for two days. 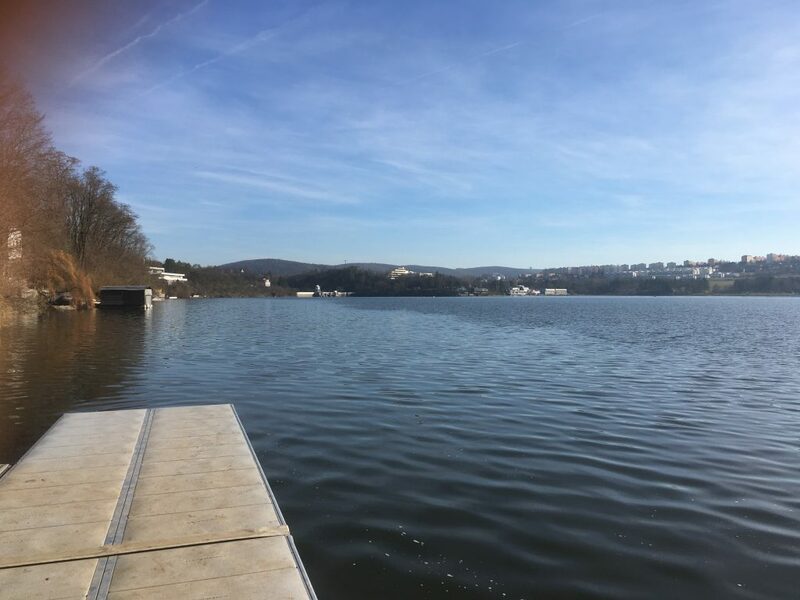 On Wednesday, we had the inaugural training for “Head of Prague”, in the mixed 8+. 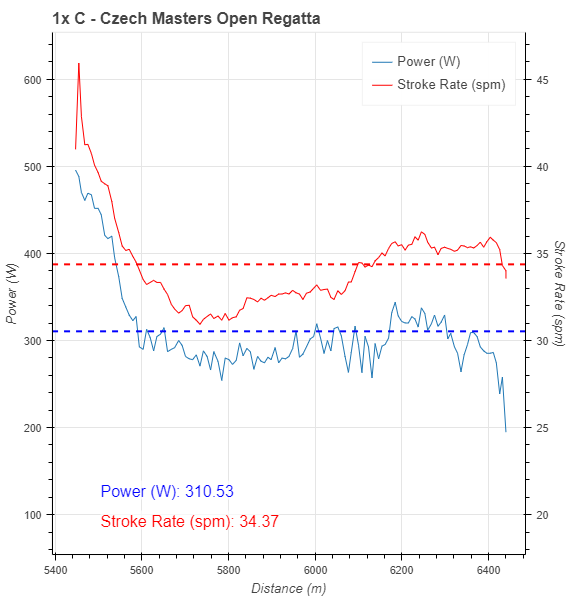 This one was easier and shorter than planned, although I suspect that I pushed the power a bit harder than what rowsandall.com estimates based on boat speed and stroke rate. 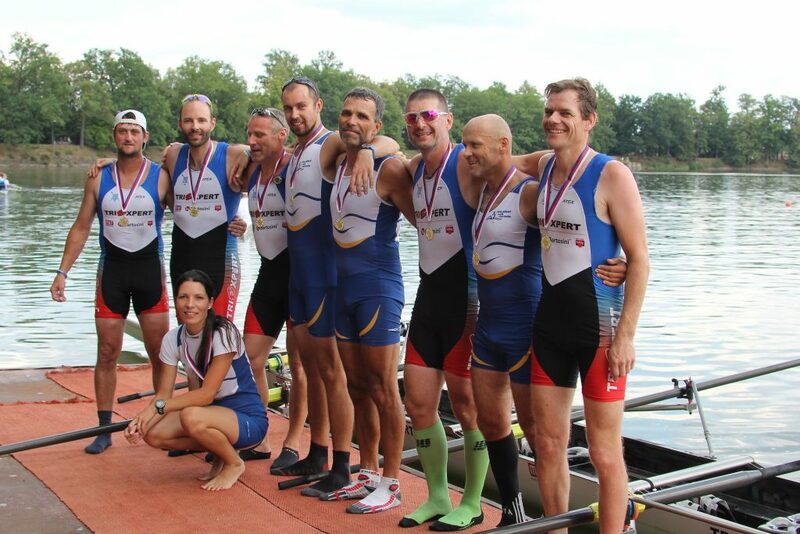 We had some replacement rowers which definitely didn’t pull as hard as Martin and I in the “engine room”. 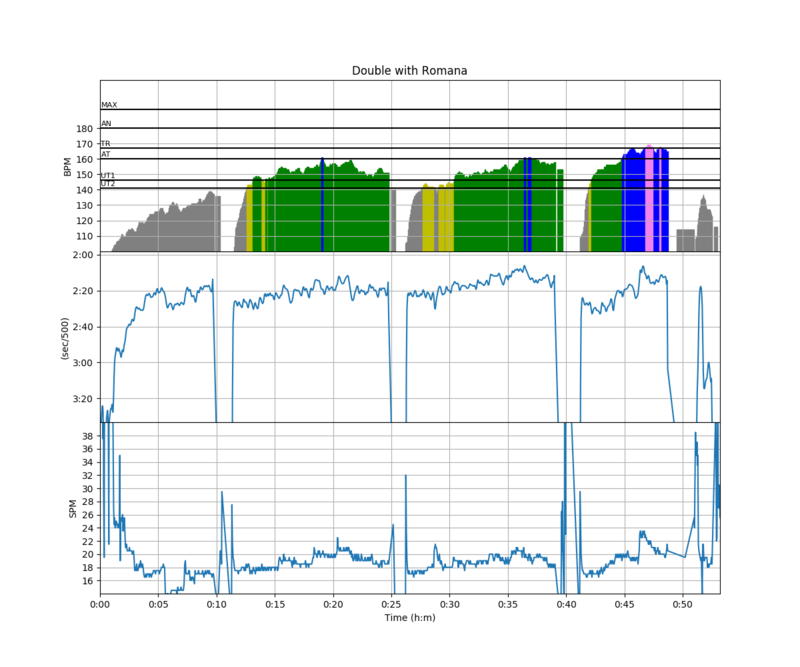 Thursday’s steady state in the single was a very nice one. I had chartered Martin to be my sparring partner and we were about the same speed. I did take care to select the same stretch of lake. 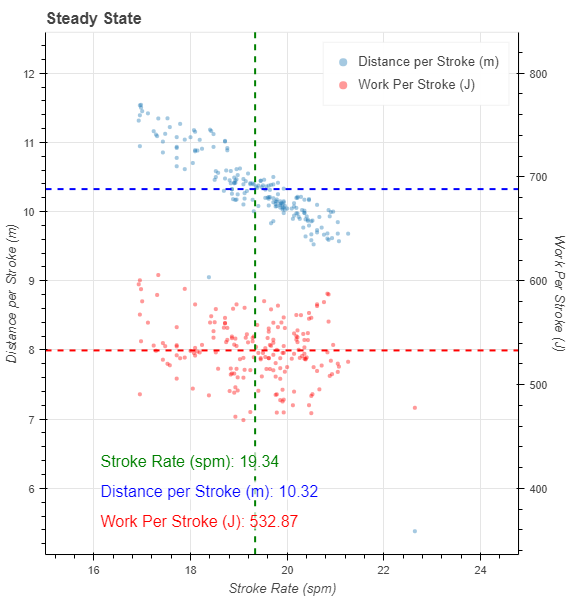 It looks like I gained 3 centimeters per stroke at very comparable stroke rates, but I was also adding a bit more Work per Stroke. 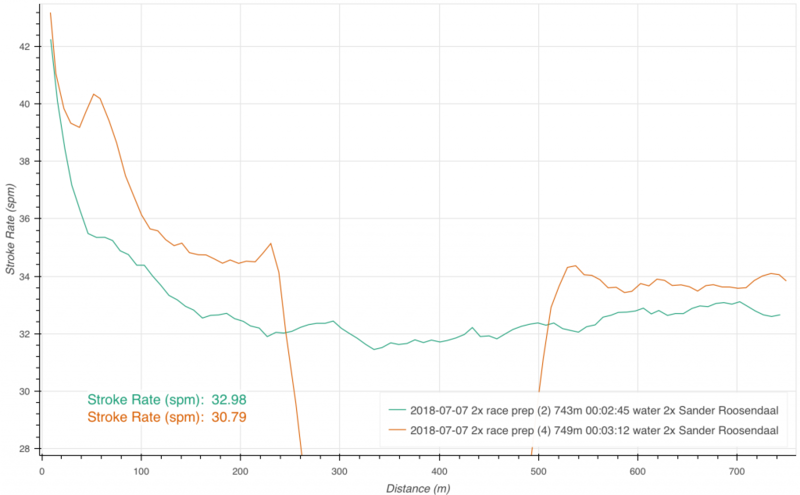 Looking at OTW Efficiency, which is a measure of the power/velocity efficiency, there was a slight increase from 60.5% to 61.5% when I was adding a slight pause at the finish. 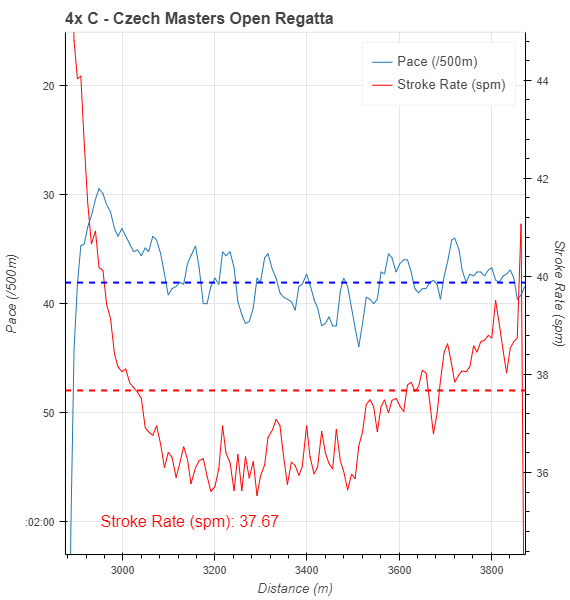 In theory, 3cm per stroke would mean 6.6m over a typical 2000m race, but the problem is that I expect the difference to become smaller as stroke rate increases to above 30spm. I think it is good to measure these things and to try and quantify them. 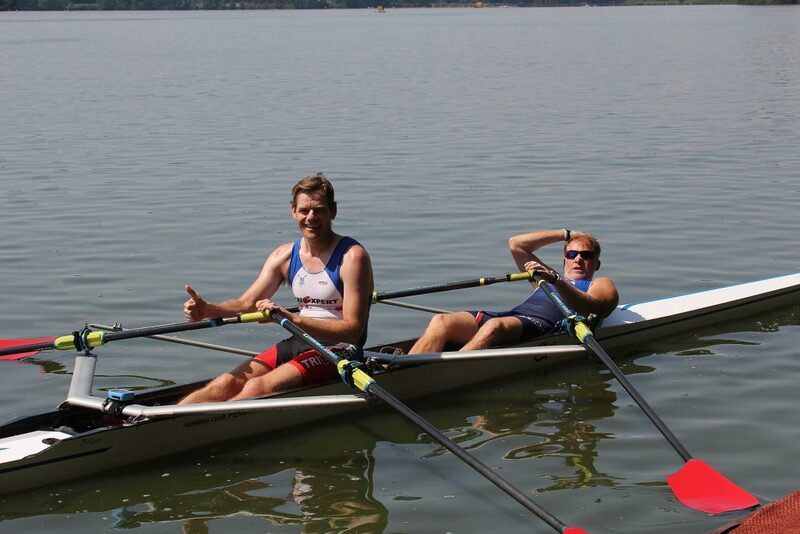 Of course, it’s also possible that I was already rowing pretty well (?) or I was not executing the “improved” stroke well enough. Also a third explanation comes to mind. 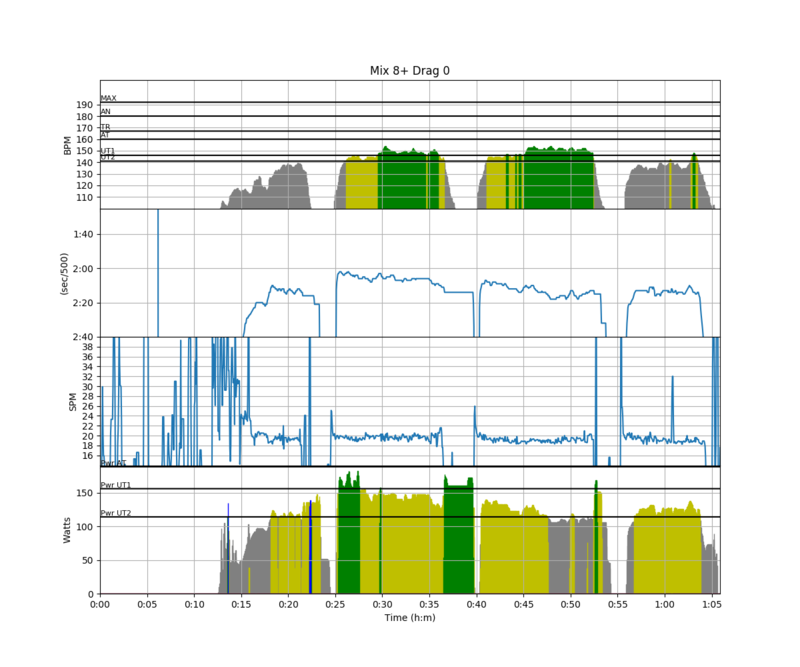 Perhaps this hyped slowness at the start of the recovery works better in crew boats, and perhaps the mechanism isn’t about boat acceleration but more about being in sync. A fourth explanation is that the wind slightly changed. Definitely, wind has a big effect on these metrics. It was only a mild wind on Thursday, but I had to discard the middle stretch of this workout as it was rowed with a very light tail wind, improving the distance per stroke and OTW efficiency numbers. More to follow. 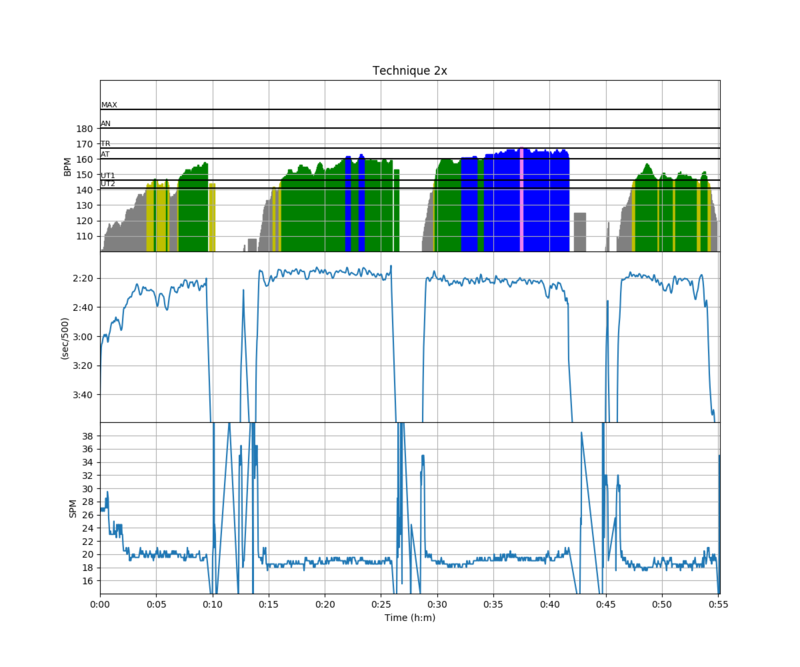 I am really interested in improving my efficiency on the recovery. I had a morning swim planned as Friday’s recovery cross training, but they are still reconstructing the 50m indoor pool and the outdoor pools have already restricted opening times (because the school vacations have ended). I also had some late conference calls (until 9pm on Friday evening) so there was no time for a light evening workout. Also, I had started to develop a head cold. This changed my plans for the weekend. 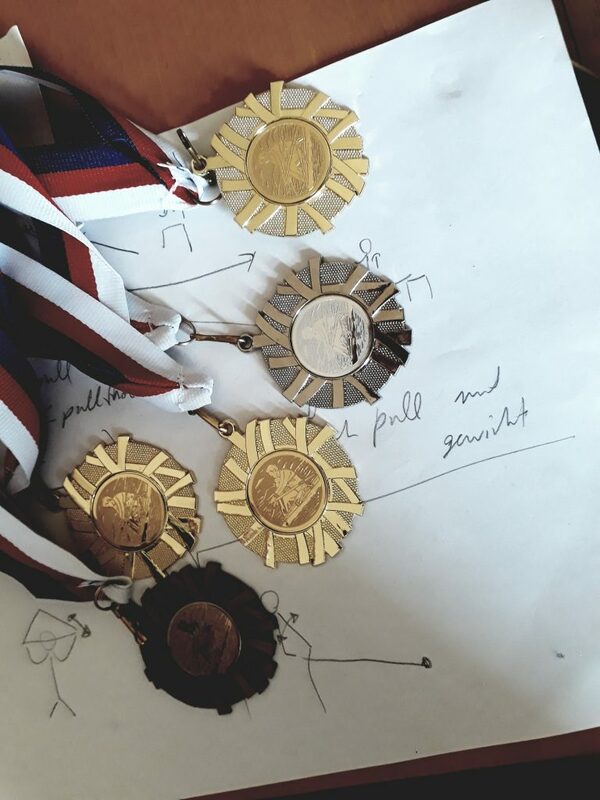 The original plan was to do a hard 8km in the single and then either a cross training or a row in the double on Sunday. I decided to go for a run on Saturday (causing muscle soreness because of not having done a running session in a long time) and go out in the double with Romana on Sunday. The green line represents the stretch were we focused on our catches. We were slower than when we weren’t! 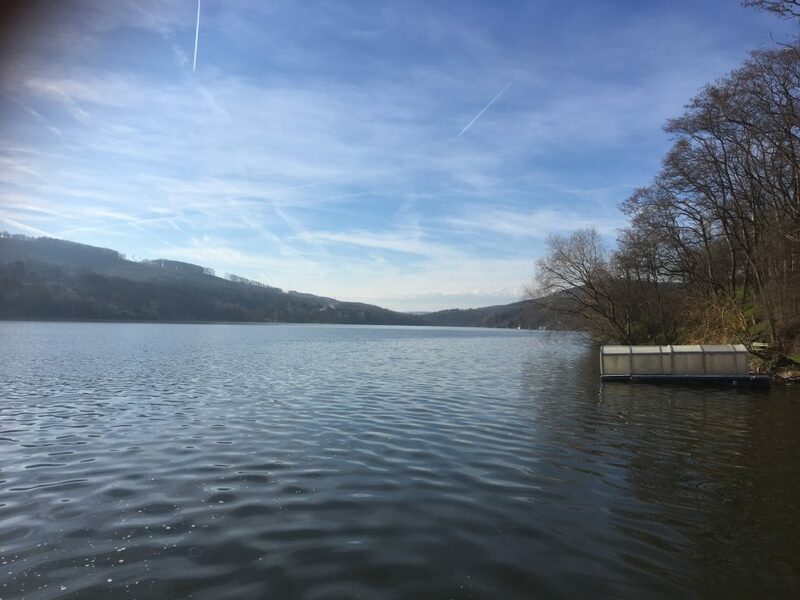 However, I have to point out that even though most of the workout was with mirror flat water, the wind increased strength during the workout, and this final stretch was rowed in head wind conditions. The blue line is the one with the delayed deceleration before the catch, which is the right most part of the chart. 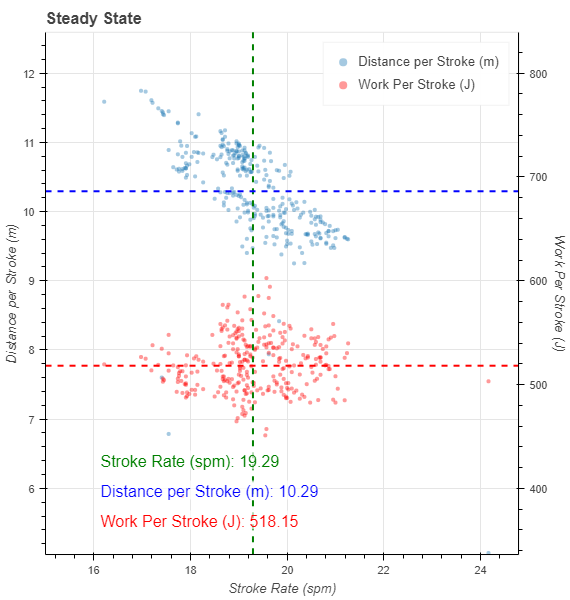 The green line is a similar stroke (at same stroke rate and on the same stretch of the lake) when we weren’t working on the catches. The wiggles at the end of the pull are not good. You typically see them when the synchronization of the tap down and hands away between bow and stroke is not good. In that sense, the double is a great boat to do these measurements. 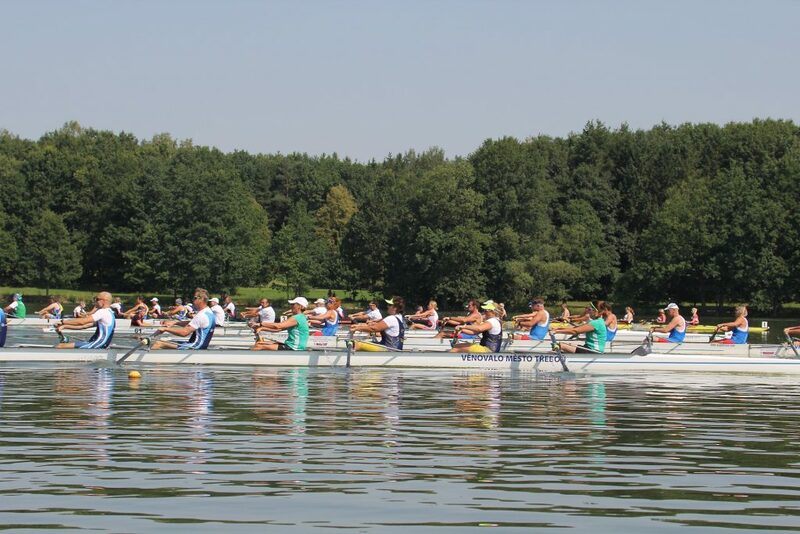 In bigger boats, one guy being out of sync doesn’t do much to the boat acceleration or deceleration, and in a single you cannot be out of sync and you’re only looking at your individual strokes. Thinking about boat acceleration charts, another thing should be noted. When rowing at a steady average boat speed, the area of the positive (acceleration) part and the area of the negative (deceleration) part should always be equal. 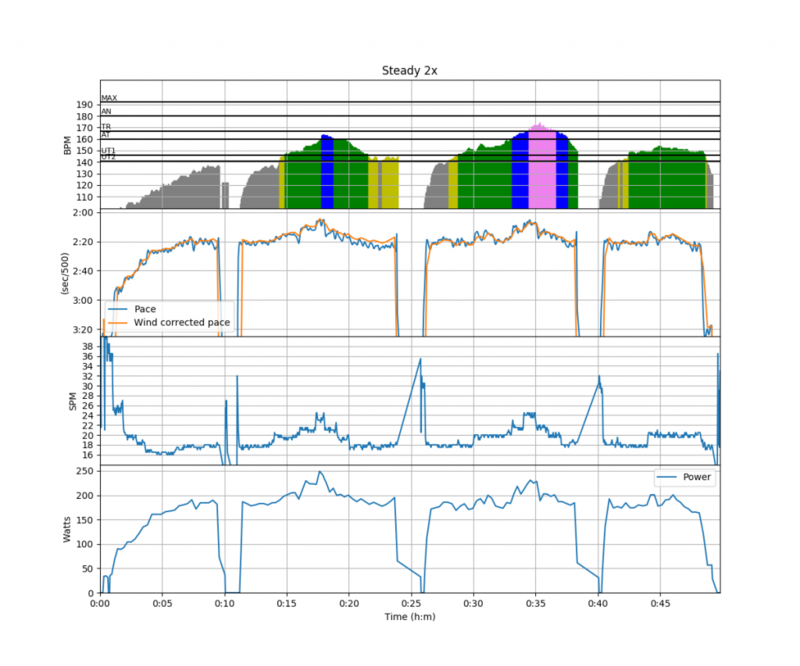 So, if I change something that makes me row more efficient, the boat should speed up a bit. 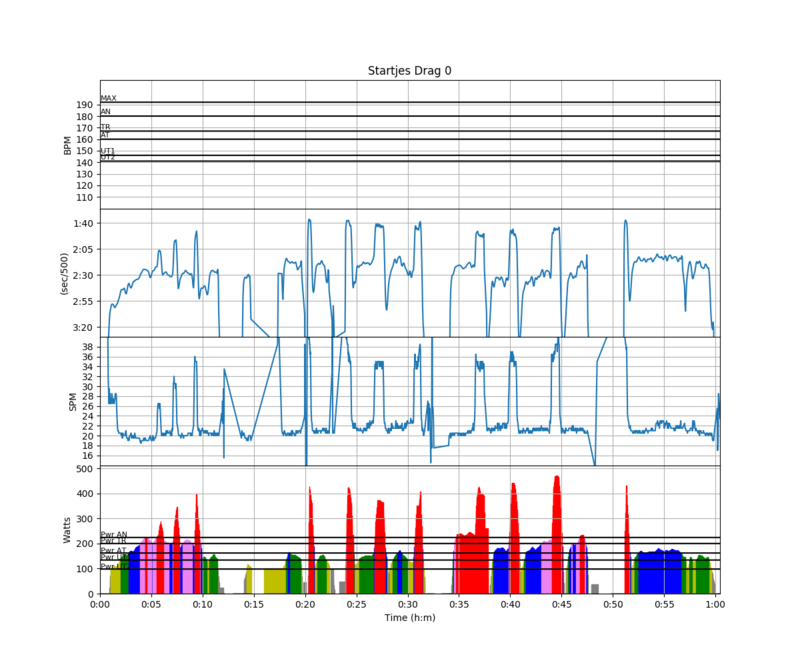 Because at higher boat speeds, drag increases, thus increasing the deceleration. 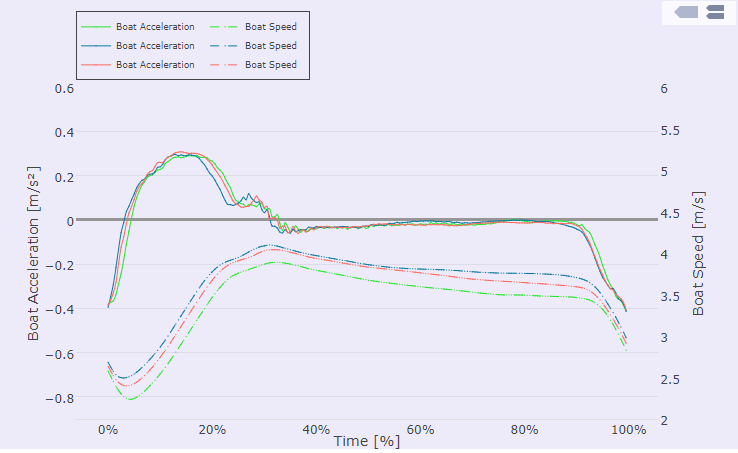 What I am trying to point out is that looking at boat acceleration charts one has to be very careful about comparing two curves if they are taken at slightly different boat speeds. 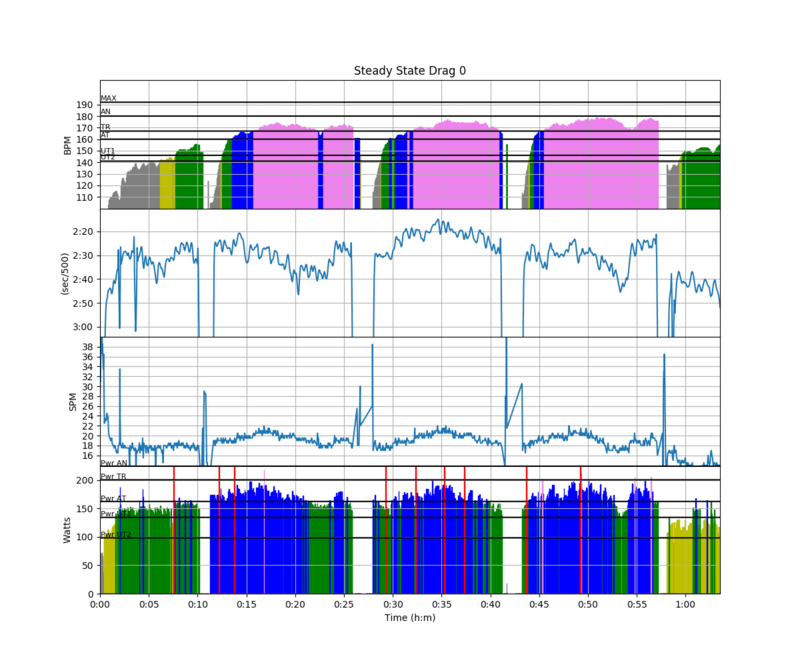 In this case, you can see that although we are managing to delay the big deceleration (checking) of the boat just before the catch, we are paying for that by slightly higher deceleration during the first part of the recovery. And again, we’re trying to look at very subtle things here, where we always have to bear in mind that the effect of wind or stream may completely overwhelm any slight speed benefits. Last chance to row the double before leaving to India on a business trip. Romana and I did just 10k with lots of technique exercises. Watching the video from the Munich (winning) race had made her think about a few technique flaws, her being shorter and taking the catch slightly early. I think the early catches were a specific of that race in Munich. We led the field so early and we were increasing our lead so fast that Romana was in unknown race tactics domain and mistook my shouts for calming down for power tens. 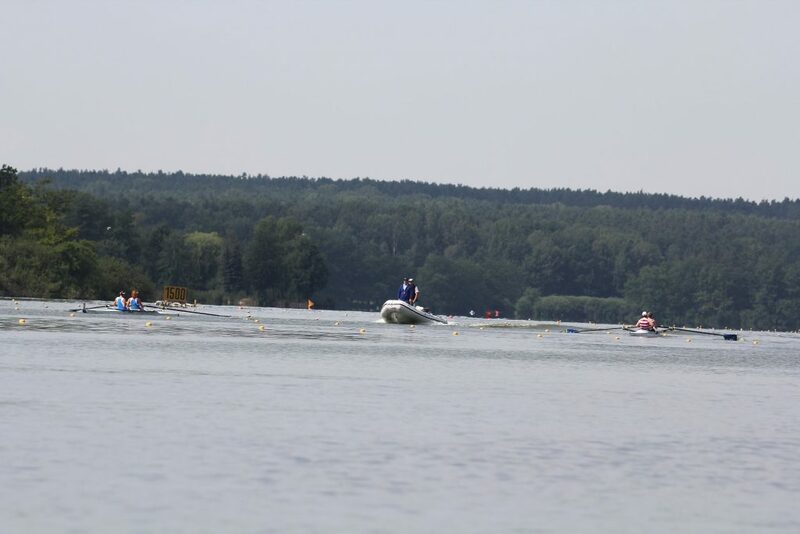 Racing in CZ, it is almost always trying to come back from behind. We had Martin Krocil with us in the launch and he confirmed, Romana’s timing was perfect. She was just a bit shorter. We did some technique exercises to determine the exact catch length and then our focus shifted to the tap down and hands away. 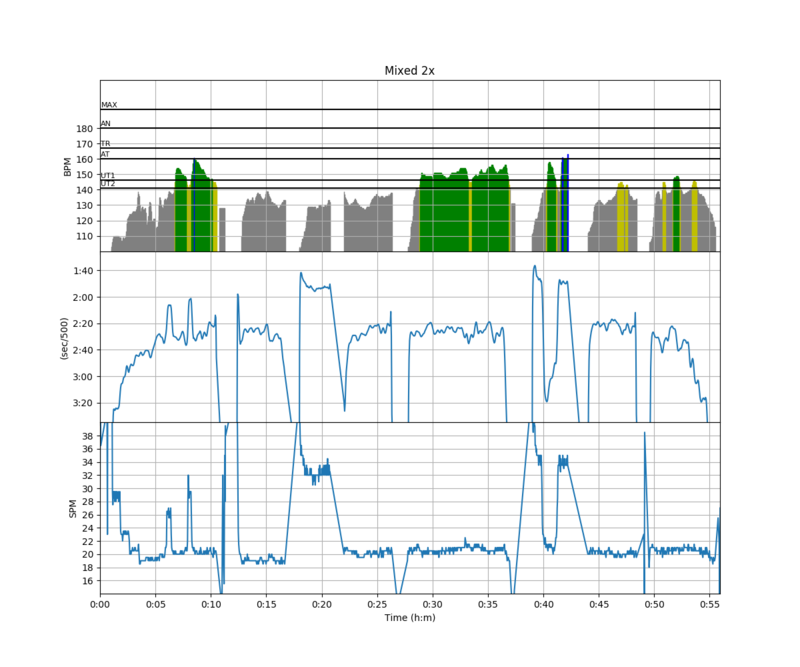 I had RowP (https://www.rowingperformance.com/) running in the mode that shows the boat acceleration. 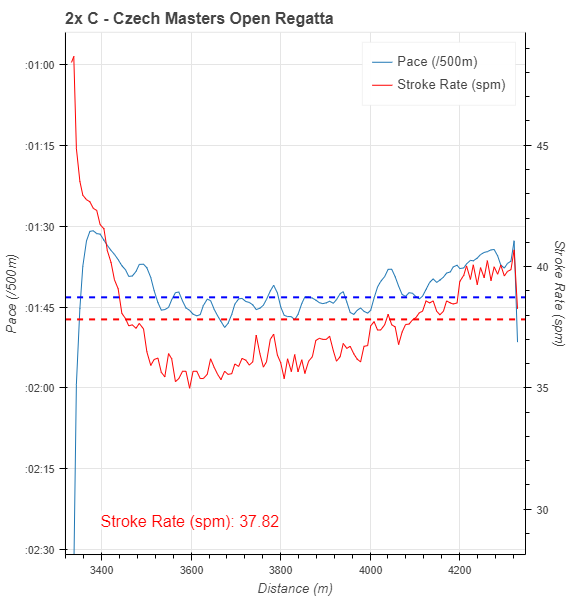 This chart is showing averages over a few strokes recorded between 15 and 30 minutes into the workout. 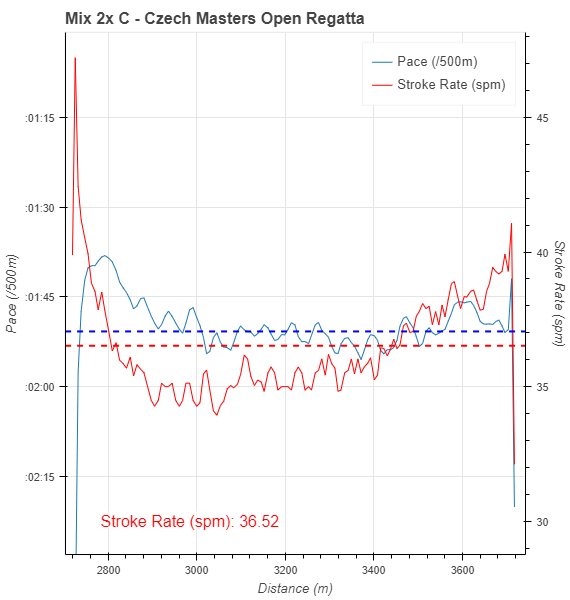 When running in real time you can see the boat acceleration of the last stroke. The interesting feature I should the little acceleration bump around 30% in the chart above. When our timing was good and synchronous, that bump was short and sharp. When the timing of the hands away was off, the bump broke down in two or three smaller bumps. 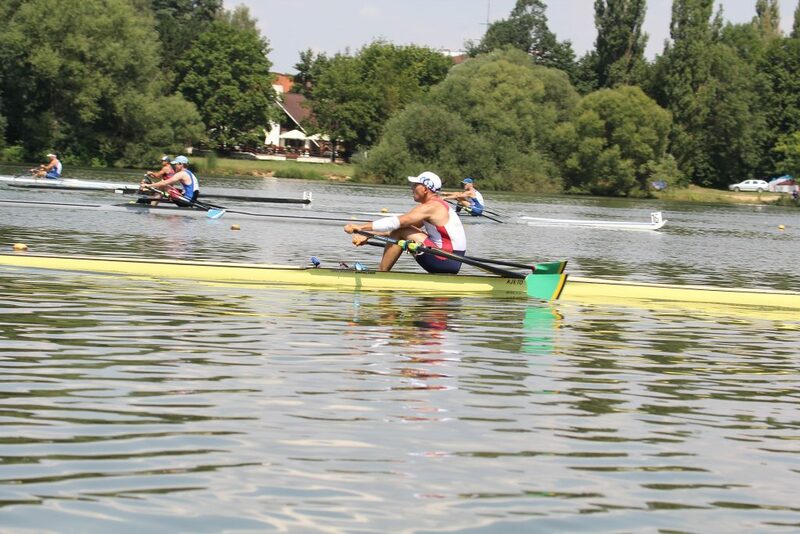 We also measured oar angular velocity and oar trajectory (on my right scull) but I didn’t look at it during the race. 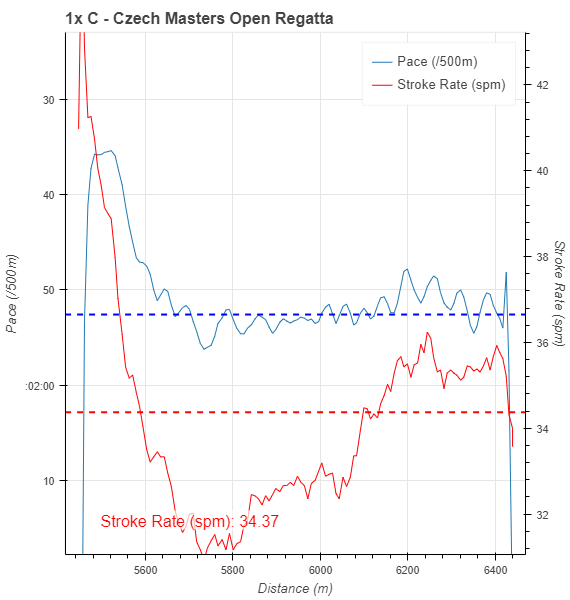 The only parameter I looked at now and then was the total angle reported by the RowP app, because without an Empower Oarlock on the double this is a good alternative way to look at stroke length consistency. Here are the charts anyway. It was a light training but that was good. Temperatures were already very high, even though it was only 10am. We did a workout in the quad. The quad was a ad hoc crew that we combined such that no rowers would stay on the shore. 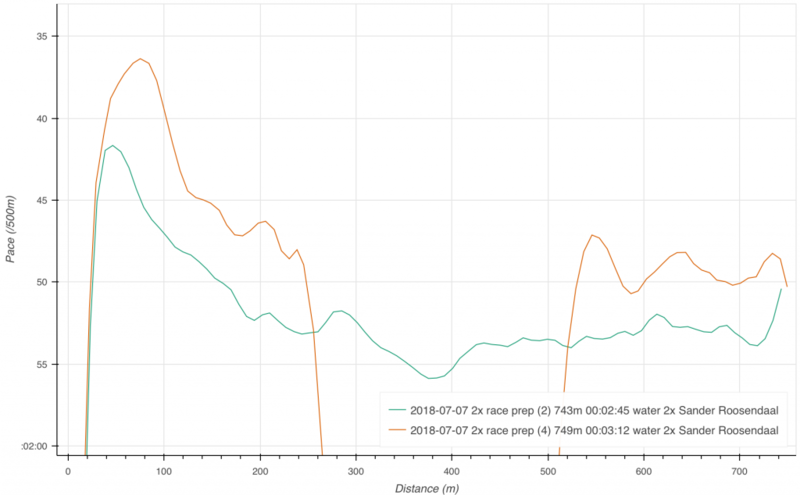 We rowed 4x2k, divided in various intervals. It wasn’t bad for an ad hoc crew. A weights session of one hour. 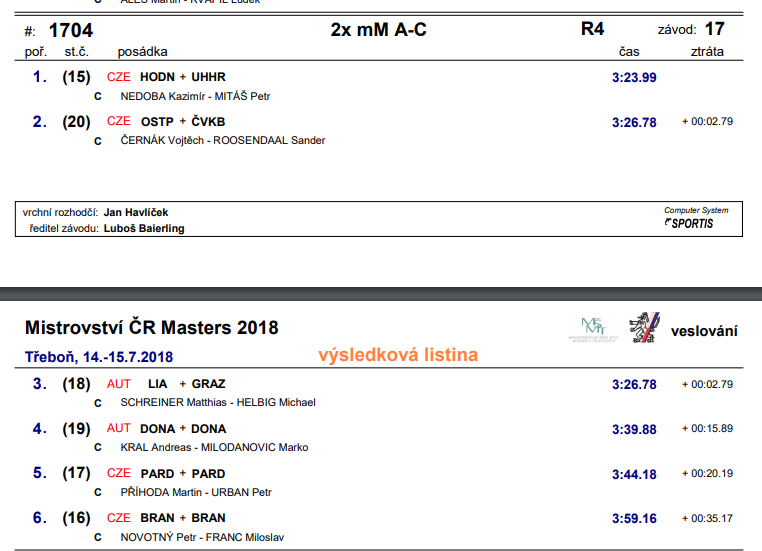 The plan called for steady state but Romana and I were in the double and had a chance to do starts and short intervals against our Masters Men B 2x. It wasn’t bad at all. We were faster in the start compared to the young guys, and in the 20 and 30 Stroke pieces we managed to row next to them. We rated a lot higher than the guys, but I am not sure if they were able to rate up. 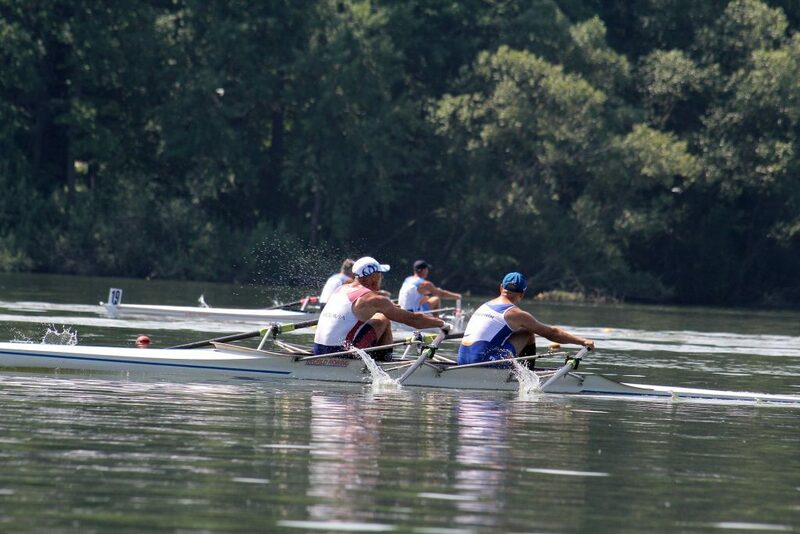 It takes some time rowing together to rate up effectively. 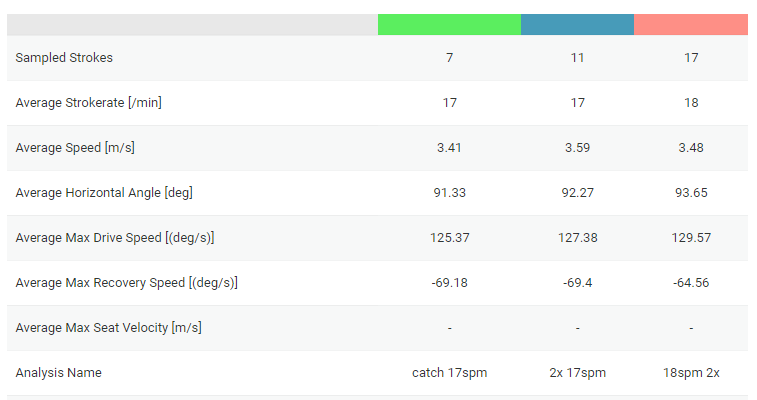 I forgot to put on the heart rate sensor and the power is estimated values. Nice workout. 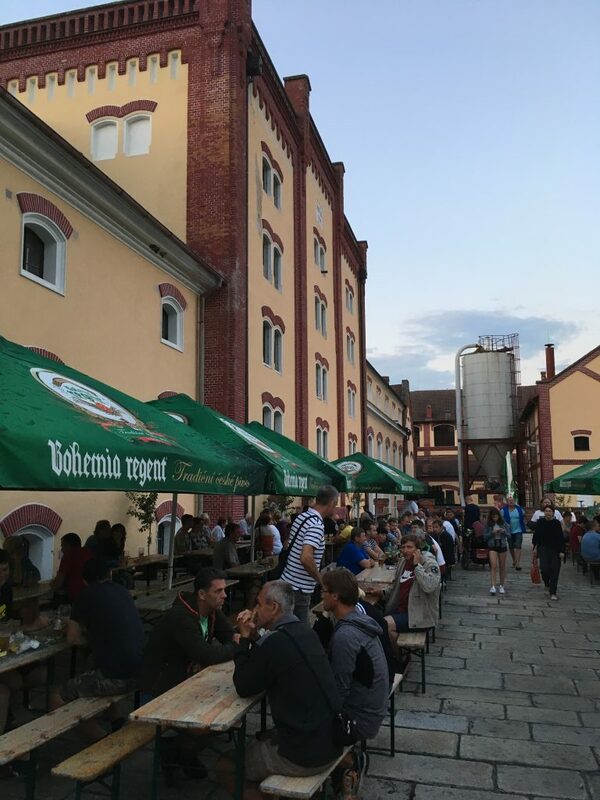 We spent a day and a half in Prague. 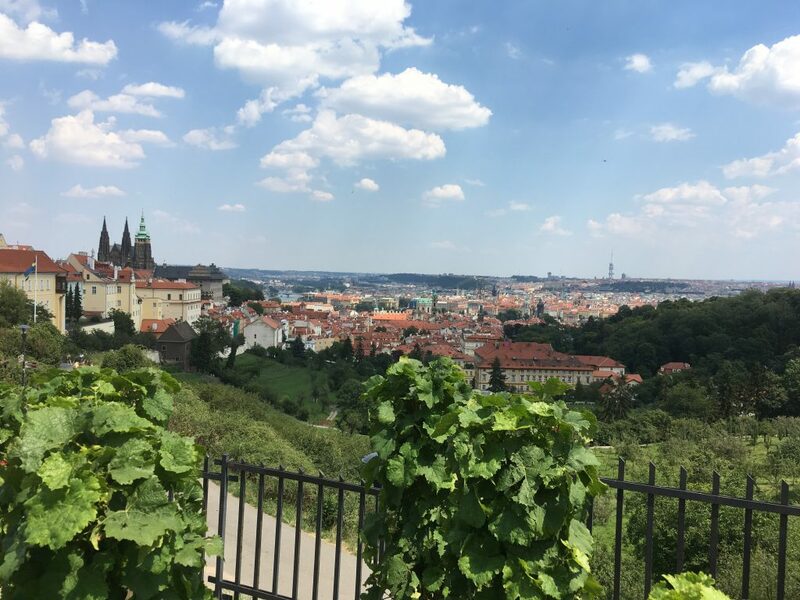 View on the city from the Strahov monastery. 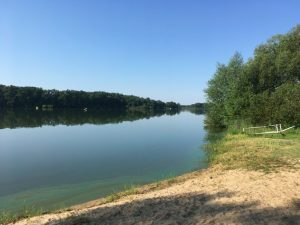 On Friday we arrived around 2pm and I did go to the lake, but there was too much wind and I felt tired, so I skipped the session. In the double again with Romana. 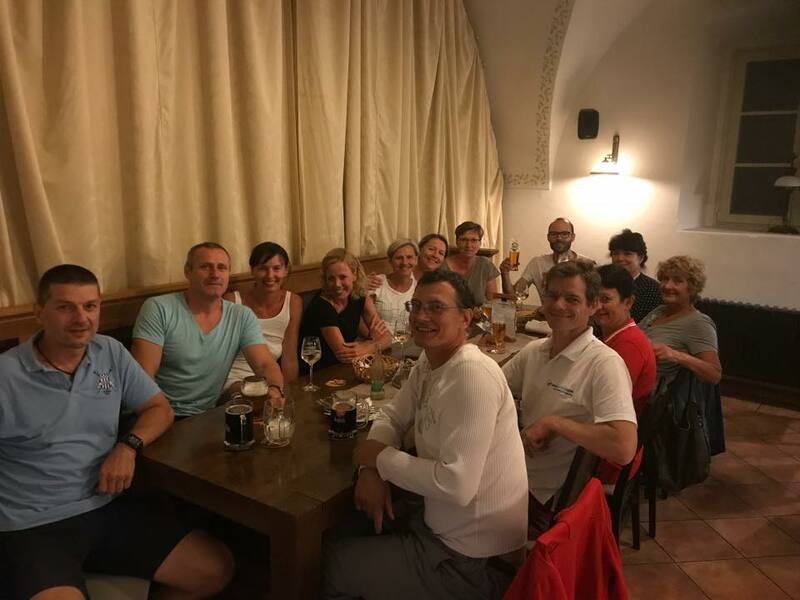 A week from now, we will be starting at the Masters Nationals (Czech Masters Open) in the mixed double. Unfortunately, I will be traveling for work early next week, so this is our final workout before the race. 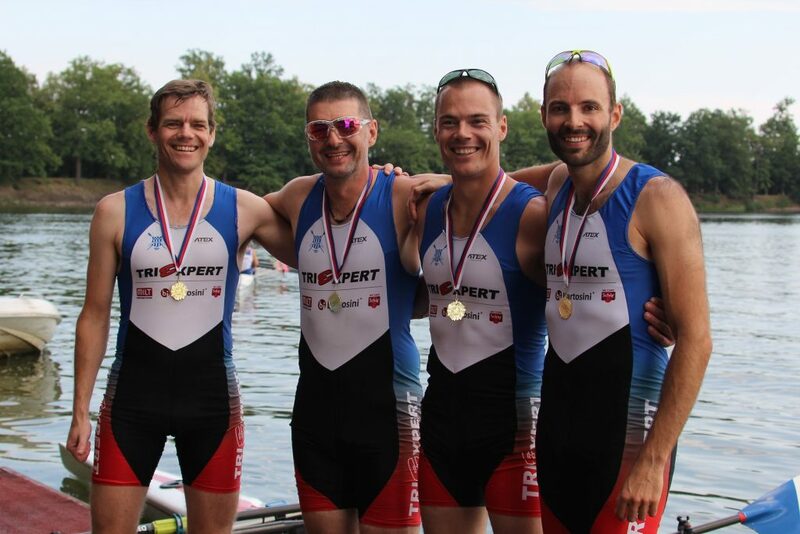 We did a 3km warming up, then a 750m at race pace, 3km steady and then 2x250m with 250m paddling. The 250s were a bit more aggressive. All pieces rowed with a cross tailwind and unpleasant chop.